I am back from my blog break to share my scrapbook layout created for the Get It Scrapped article about two part titles on scrapbook pages. For my layout I wanted some metallic letters to suit the cute photograph of my son dressed up as Rob the Robot. I decided to create my own using some mirrored sheet by Tim Holtz. It is thicker than card and comes with a protective layer over the mirror surface, so you can write on the protective layer not directly on the mirror sheet if you don’t want the pen to show (I used a CD marker so it didn’t smudge) and then cut it out by hand. 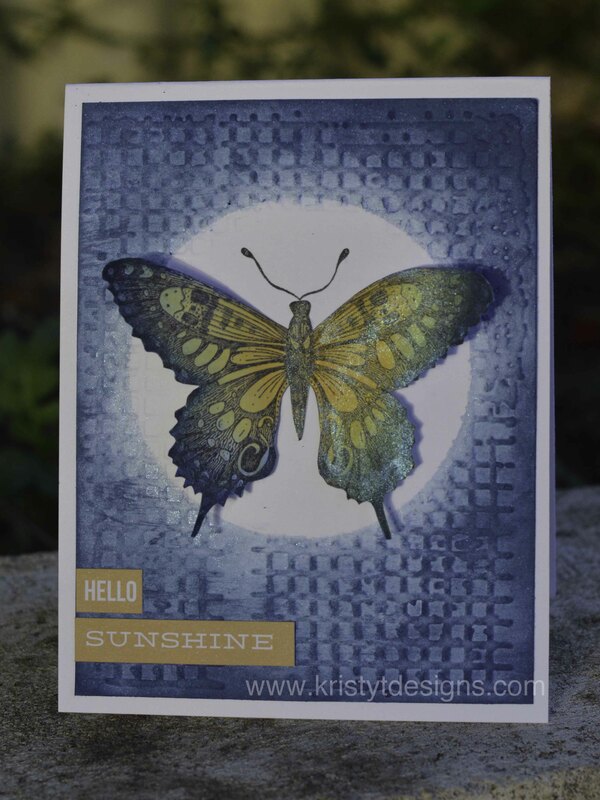 I added some texture to the alphas using a texture fade embossing folder and my sizzix. After peeling off the protective film I coloured in the centre of my letters R, B and O since it would have been too difficult to cut out the small pieces. I decided to use all capital letters for my hand drawn alphas and then used a silver pen to handwrite in a cursive style for the “the” part of my title. By mixing fonts and styles of alphas it adds visual interest to your title work. You can see more ideas in the article at the Get It Scrapped blog here. To create my layout I went with a bit of star theme to support the idea of space, the colours silver and black, letters (relating to the kindy theme), cogs and metal embellishments. I added some texture to the by distressing the edges and tearing the silver paper to have uneven edges. If you have any questions about how I created this layout, leave me a comment and I will be sure to reply. Thanks for stopping by. I will be back to regular posting on Friday. 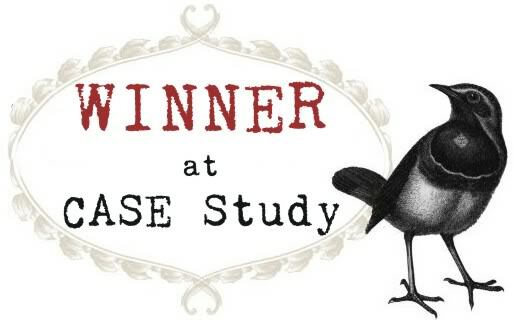 I am playing along with CASE Study again this week and had some fun using up another one of the Distress Paint tag backgrounds that I made. 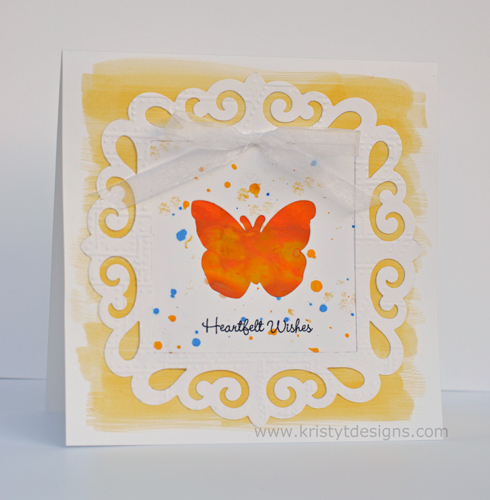 I took inspiration from the colours Julie Ebersole used on her card and also the butterfly (You can see the current Case Study blog challenge here). The main technique for the card is basically to use the negative from your die cut. This is a great way to use your die cuts for a different look and seems to have become a more popular technique with more cards around that feature it. I created the background behind the white frame by diluting some Sunshine Yellow Dylusions Ink Spray and then painting onto the card base. Well I am off to keep working on the projects for the upcoming In-Store Weekend Workshop at Southern Stationery. Over the next couple weeks or so there will be sneak peaks of the projects on the Stefs Paper Crafts blog. I missed my usual post yesterday since we had a bit of a crazy day – just super busy! I had done the basics of this card yesterday after looking at the latest CASE Study challenge. 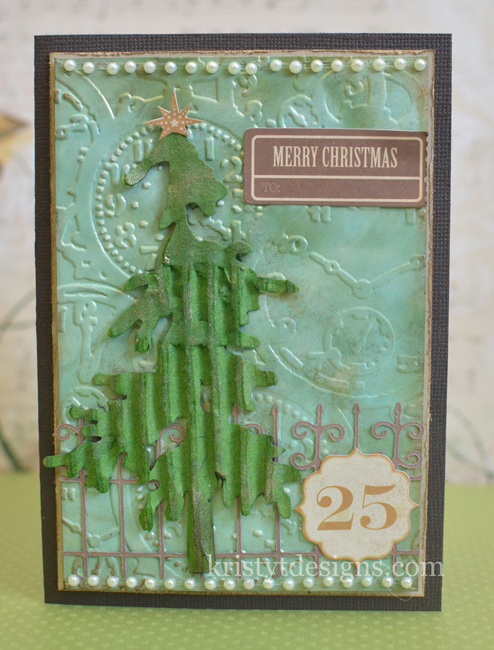 Teri Anderson is the muse for this month and you can see her card at the CASE Study blog here. 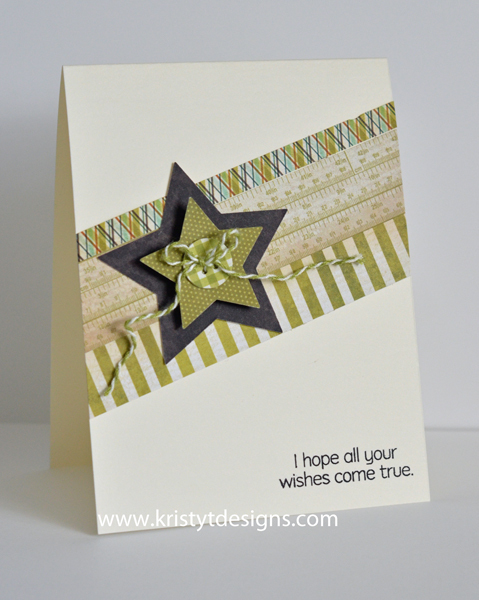 The design of the card with the diagonal stripes is a bit different for me but I think worked really well with the star embellishment to make a masculine birthday card. The patterned papers I used are from the My Minds Eye Collection – Lost and Found Two 6×6 paper pad which is a little bit of an older collection now. The star die I used is from Sizzix and the button was made using the Martha Stewart Buttons Large Double punch (love this!). 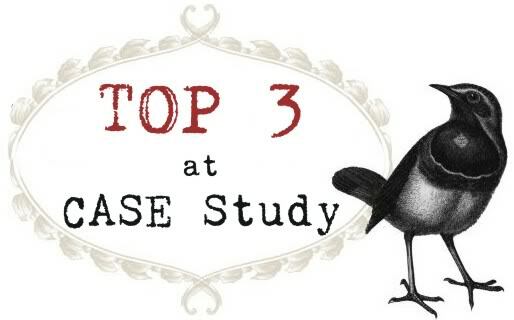 Hope you get a chance to check out the other cards people made on the CASE Study blog. This week has been a busy week for me with all the usual stuff but also putting the finishing touches on the layouts for the Weekend Workshop Stef is holding in October, and yesterday I made 74 yellow cupcakes for a fundraising activity the kid’s school is holding. So I haven’t had time to make a new card for today but thought I would show a card I made a while ago that features tissue paper flowers. This was one of the things I taught to the ladies who attended the workshop in June. These flowers are really quick to make and super fun to spray with all kinds of mists, not just the bright ones! 🙂 I have got some fabulous new La La land stamps that I can’t wait to colour so I am hoping to get time to make some cards over the weekend. I have made a Fathers Day card using the Kaisercraft Sears and Son papers based on the Deconstructed Sketch 67. 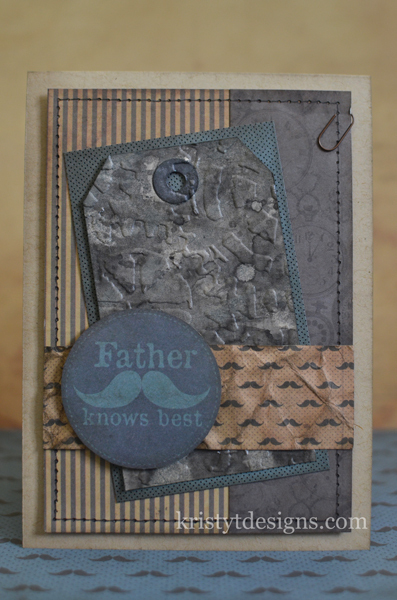 I had made the tag awhile ago when I was just using up some mist after I had made a journal cover, but I wanted to give it a little more texture so used the Tim Holtz cogs embossing folder the ‘wrong’ way up so I could use the ‘debossed’ side. I stayed pretty true to the sketch (You can see it here) and so the card was relatively quick to make. The thing that took the longest was probably piercing the holes to do the faux stitching (gotta love this if you don’t have or can be bothered with a sewing machine!) I love my sewing machine but if it is away in the cupboard sometimes I just do faux stitching instead. I know it is only August but I thought I would show a Christmas card in this little series of alcohol ink cards. Once I had made the background I then used the pocket watches embossing folder to give it texture. I added a little bit of distress inks to the edges but you could just ink all of the raised areas to give it a different look. I die cut the pine tree out of cardboard and then sprayed with Cut Grass Dylusions Spray Ink. When it had dried I rubbed a little bit of gold Perfect Pearls over the tree. The fence was die cut using the Memory Box Die – Estate Fence and the stickers are from one of last years Christmas collections by Kaisercraft. If you want to see more of my alcohol ink cards, just click on the category on the sidebar. There is another Christmas card here and a flower card that features alcohol ink on sticky back canvas here. Supplies: Bazzill – Java and Kraft, Kasisercraft Sticker Sheet – December 25th, Tim Holtz PineTree Die, Dylusions Spray Ink – Cut Grass, Kaisercraft pearl strip, Memory Box Die – Estate Fence, Tim Holtz Alterations Texture Fades – Pocket Watches Embossing Folder, Foam Adhesive, Alcohol inks, Glossy Cardstock, Gold mixative, Blending solution, Distress ink – Brushed Corduroy and Walnut Stain.